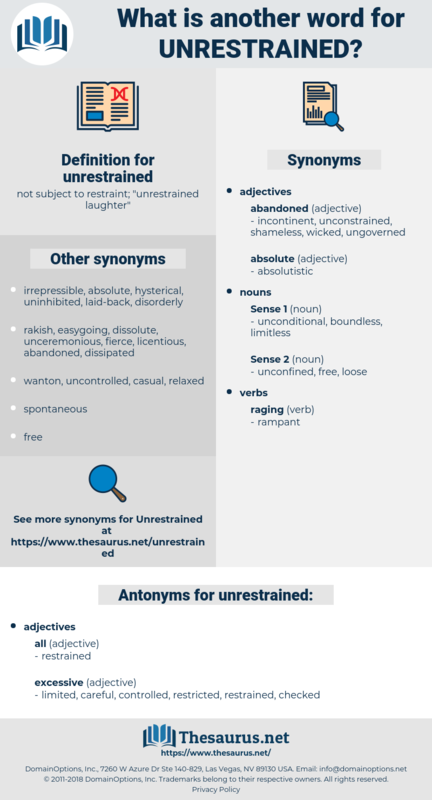 What is another word for unrestrained? not subject to restraint; " unrestrained laughter"
unhindered, unimpeded, unaccountable, boundless, unreserved, unqualified, relentless, indefinite, unconditional, open-ended, ruthless, infinite, savage, all-out, wild, uncompromised, wanton. unlimited, unrestricted, uncontrolled, untrammelled, unchecked, limitless, unbounded, rampant, unmetered, unregulated, frantic, uncontrollable, inordinate, cut-throat, free, Freer. careful, limited, checked, controlled, restricted. 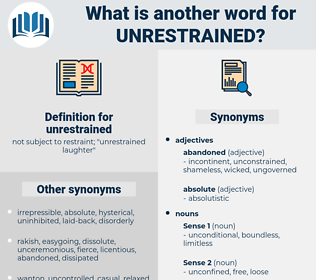 inflexible, curbed, unemotional, harsh, conscientious, chained, detached, aloof, unconcerned, dispassionate, tied, implacable, fastened, tempered, fussy, strict, emotionless, governed, self-directed, kidnapped, reserved, icy, exact, impassive, rigorous, fettered, rigid, modest, punctilious, severe, constrained, taciturn, shackled, tame, introverted, Anchored, hard-boiled, bolted, inhibited, painstaking, bound, stern, bashful, phlegmatic, reticent, silent, scrupulous, meticulous, glacial, hard, unfree, quiet, Hard-hearted, enclosed, tight, Immured, cold, penned, chilly, indifferent, unfeeling, retiring, frigid, shy, undemonstrative, unfriendly. But in this case the barriers are thrown down; and thus the love of unrestrained activity is gratified. The car itself took a notion to quiver with the promise of joy unrestrained.